The Chicagoland Sky Liners applied for chapter affiliation to the American Kitefliers Association as soon as we became a club and elected officers. 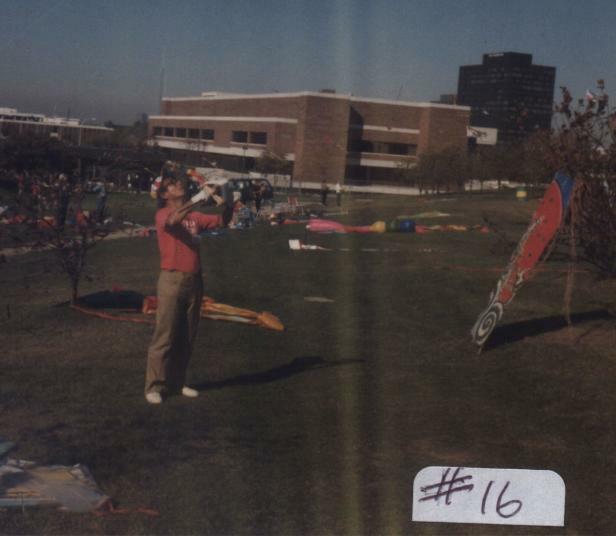 The AKA was the National organization for kiteflying, and the AKA hosted the Grand Nationals and the Convention. I really wanted to go to a Convention! Lee and Anita Hoover had been to several previous conventions and were always relating great stories about their trips to the Nationals. I really wanted to go to a convention! Lee and Anita said that I should come with them to the 1982 AKA Nationals in Detroit, Michigan. It really didn’t take much convincing. In the mid 1980’s the American Kitefliers Association wasn’t a very large organization. The national club had about 350-400 active members. The Conventions were also small affairs. I think that the attendance for the 1982 convention was around 200. The conventions in the 80’s were a far cry from the extravaganza’s of Wildwood, NJ in the 90’s. The fliers that attended were a closer knit group of people. AND slightly stranger than the current crop of conventioneers. The Convention, though billed as The Detroit Convention, actually took place at two golf courses, 15 miles west of Detroit in the suburb of Southfield, Michigan. That’s at least a full days drive from Chicago. I elected to spend the entire first part of the week touring and camping in the northern parts of Michigan. The convention didn’t start until Friday morning anyway. This is probably where I’d like to pass on a bit of advice about Kitefliers Conventions. Stay at the Headquarters Hotel! No matter how expensive it is, you will ALWAYS miss something or other or be late for some event if you don’t stay where the action is. I had to leave the auction early just to get back to my camp before the park closed. Try and get dressed for a fancy banquet in a tent! My most major error with the campout decision was the fact that the park was right near a Ford plant. This particular plant was closed with layoffs. EVERYONE in the area really didn’t like my Toyota! GO WITH SOMEONE THAT’S BEEN THERE! Lee and Anita Hoover (Pic. #1) took it upon themselves to be my tour guide at the convention. They introduced me to everyone they knew. Lee and Anita DID know everyone, too. They were very excited to tell all their kiteflying friends about their new kite club in Chicago and to introduce me to them. When you attend a convention it may seem to a beginner to be very clannish. Just think about it! Are you a member of a club? Are you a member of a team? If you know other people at the convention you will have a much better time. Without a convention guide you can volunteer to help. This will definitely help you get to know a lot of people, and event organizers are always looking for help. 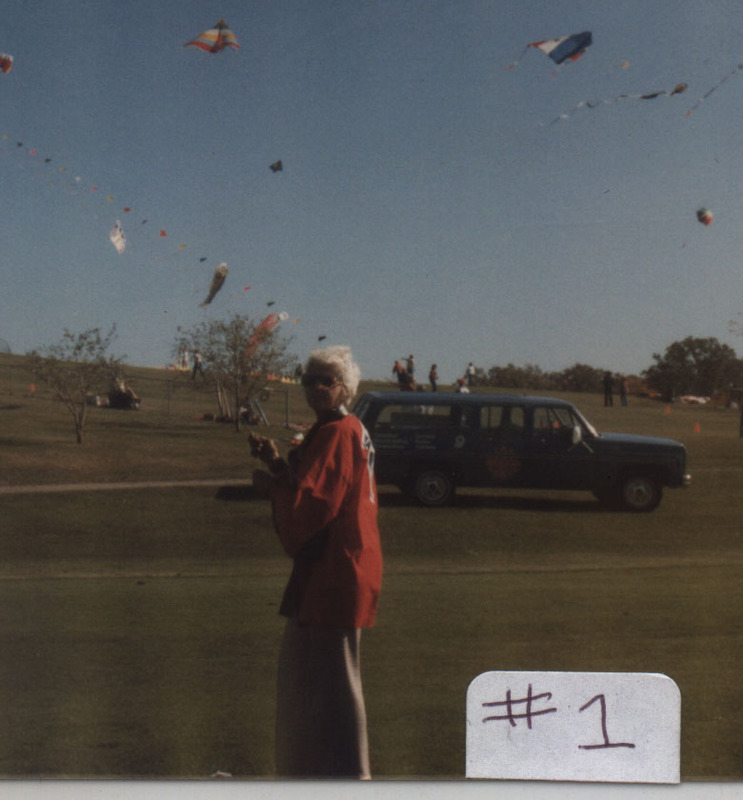 Between the people, the kites, and the field, I wasn’t really sure what amazed me more. Here we were on a golf course putting green. And I kid you not; they vacuumed the dew off the field before we flew in the morning. I spent much of the three days just walking around and taking it all in. 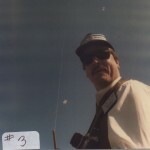 Ron Witt was next, (Pic. #3) auctioneer and kiteflier from Georgia. Had something to do with the Atlanta Braves and could Ron rattle off that auctioneers lingo! I must have really looked like a “greenie” out walking on the field. Soon an Oriental looking guy came up to me and asked if I would help him launch a kite. “Sure”, I said, “What do I do?” I later learned that this was Lee Toy ( (Pic.#5) and he really didn’t need any help launching his parafoil. This was a pretty big one (Maybe 150 sq. Ft.) and beautifully appliquéd. 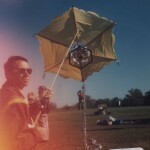 Lee told me about his kites, his motorcycle (How did he know I liked Motorcycles?) and before I knew it I felt more comfortable. Another kite that caught my eye before the flier was this amazing kite that looked like a Merry Go Round. 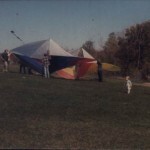 It even had little horses that turned as the kite flew. The pilot and builder was Bevan Brown. (Pic. #7) Bevan was a previous AKA president and a great person to talk with. 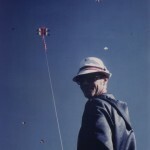 Bevan flew his kite with the assistance of a deep-sea fishing reel. That way he never had to worry that the kite would crash into the ground. 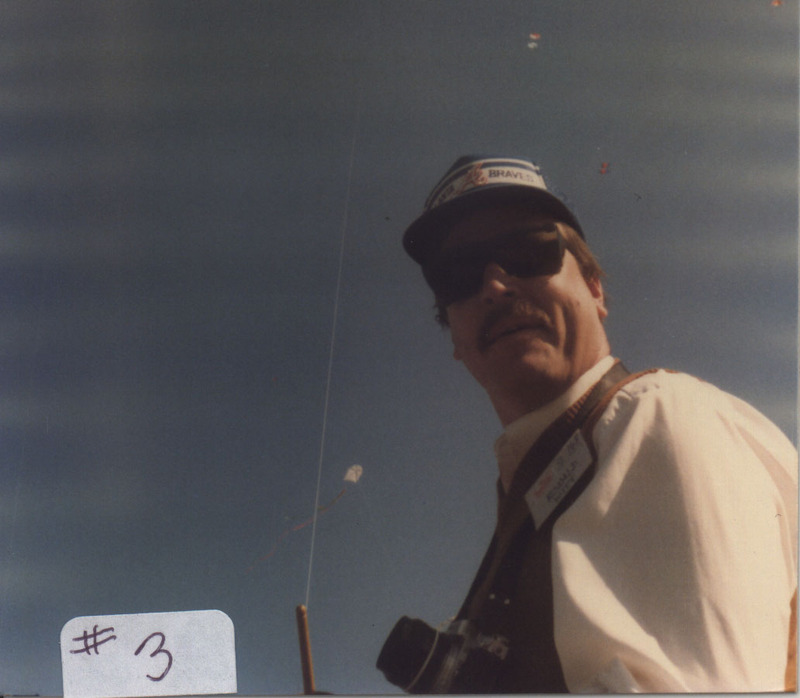 Another kiteflier that used a deep sea fishing reel to fly his kite was a kiter I called “The Red Baron”. This “slightly” eccentric flier wore a red jump suit and a leather flying helmet. (Pic. 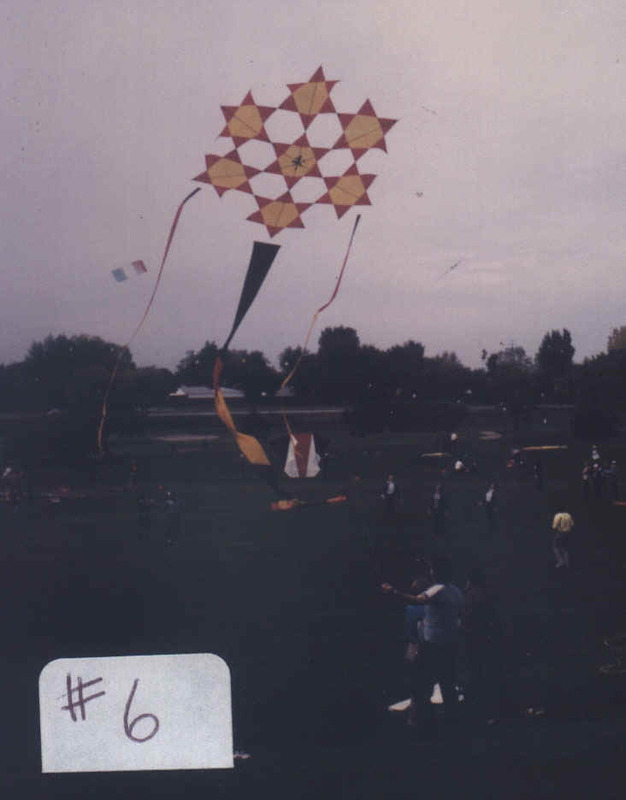 #8-#9) He flew several airplane kites and the one that I remembered the most was the Spirit of St. Louis. I think the Red baron was from Canada? He even dressed for the banquet with red shoes, socks, belt, pants and shirt. Anita Hoover later told me that the “AKA sort of encourages costumes and things like that”. Little did she know that this flier would inspire me to host the “Costume Challenge” at AKA 1988 in Chicago. Another Canadian that I met for the first time was Adrian Conn from Windsor, Ontario (Pic. 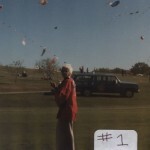 #10) Adrian was flying a beautiful kite that I believe was called the “Windsor Bug”. 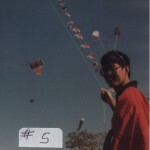 Adrian won quite a few categories for kitemaking at that convention. These were the first ones of what has become a long journey for Adrian. He has gone on to become AKA Grand Champion many times. DUAL LINE COMPETITION? WHAT DUAL LINE COMPETITION? 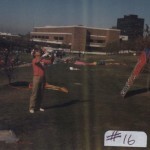 In the 90’s most of you know the area of sport kite competition consumes about half of the AKA nationals schedule, but things were a little bit different back in 1982. When I arrived at the convention I walked to what I thought was a practice field near the headquarters hotel to fly a Rokkaku I had built. 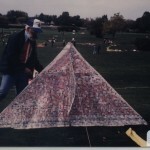 I was very proud of this hand painted tyvek kite. I had not yet seen the appliquéd creations that would be gracing the skies of this convention. While I was gawking at everyone else’s kites on the field a fella walked out onto the field and assembled a delta shaped kite, which I at first assumed was a single line kite. 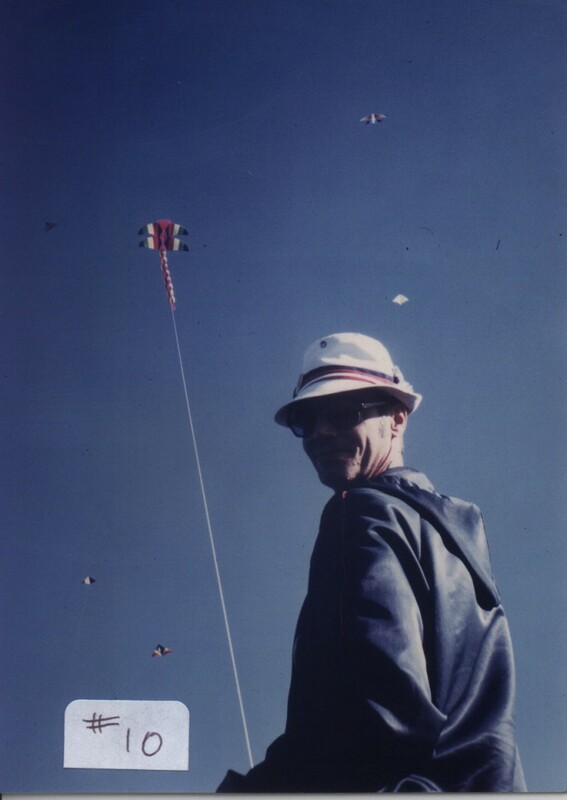 This kite flier was Don Tabor (Pic. #11) from San Diego, Ca. 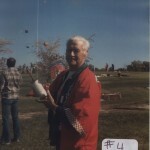 And his kite was the forerunner to the Hawaiian Team kite that would rock the dual line kite world. We were told that the field we were at was not the right one and we had to move. 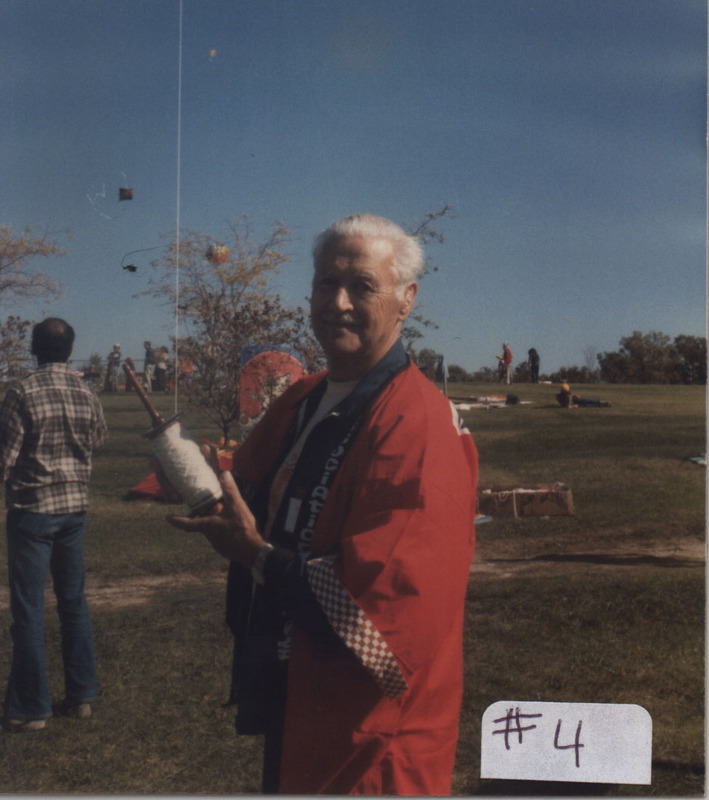 Don Tabor just launched his kite and flew across the street, past some trees and went right to the other field. I was amazed. 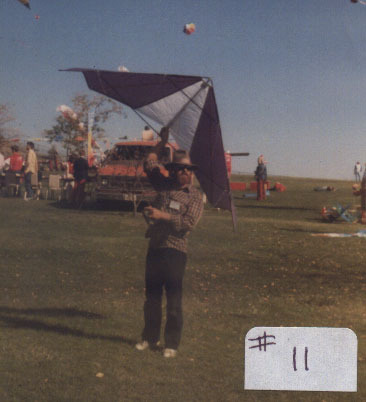 Don went on to win “The best manufactured kite” category at the convention. 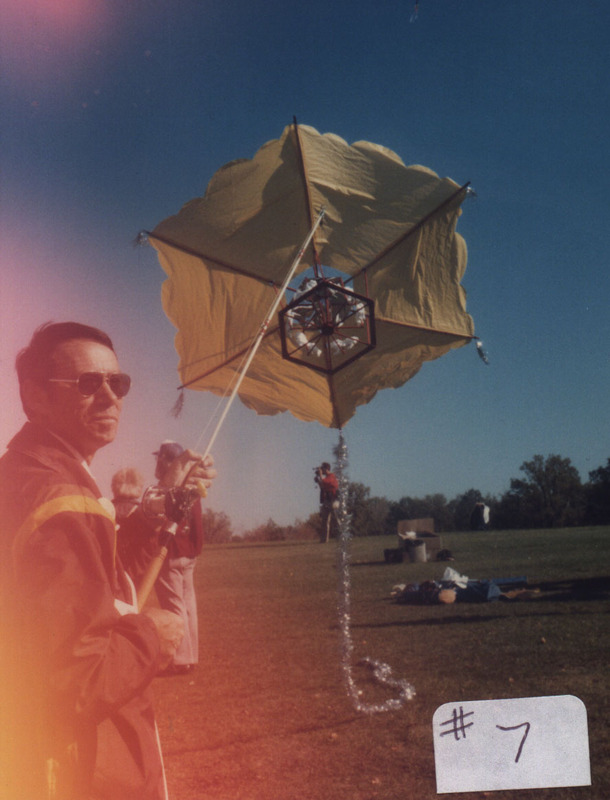 I believe this was the first appearance of this type of kite at an AKA Convention. Surprisingly enough Don did not compete at the dual line contest that was held during the weekend. 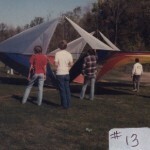 What you have to remember is that back in the 1980’s sport kites were pretty heavy. They were sparred with solid fiberglass in many cases. 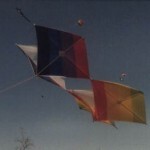 Most kites were still of the diamond variety. These kites needed a minimum of 6-8 mph to fly. 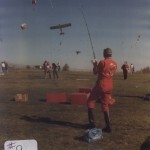 Due to the lack of wind the dual line competitions kept getting pushed back and pushed back on the schedule. Finally there was little time remaining and the dual line event had to be run or dropped. A very eccentric kiter by the name of Corey Jensen suggested that we use one of the golf carts that were parked by the field’s clubhouse. 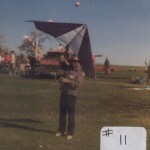 The idea was for the kiteflier to be strapped to the back of the cart and the driver would move across the field with kite, and contestant in tow. This worked for each of the three compulsories. If I remember correctly there were not many contestants and the event went pretty quickly. One of the outstanding dual line contestants and the winner of the event was previous AKA president Red Braswell (Pic. #12) Red flew a custom built Peter Powell type of dual line kite without a tail. 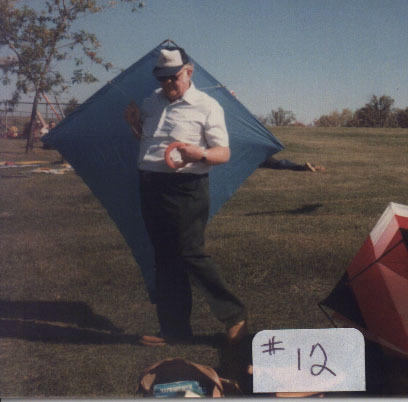 I remember being totally amazed when Red stood off to the side of the field talking to someone and he was flying his kite directly overhead with BOTH HANDLES IN ONE HAND. HOW BIG IS REALLY BIG? 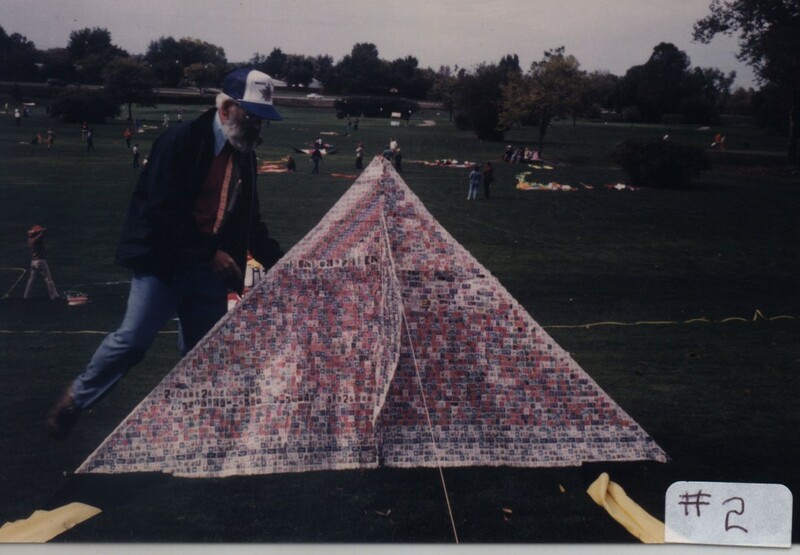 During the 1980’s one of the most popular kite making supply businesses was “The Fabric Lady” I didn’t realize that the Fabric Lady was really Bill Tyrell until I arrived in Detroit in 82. 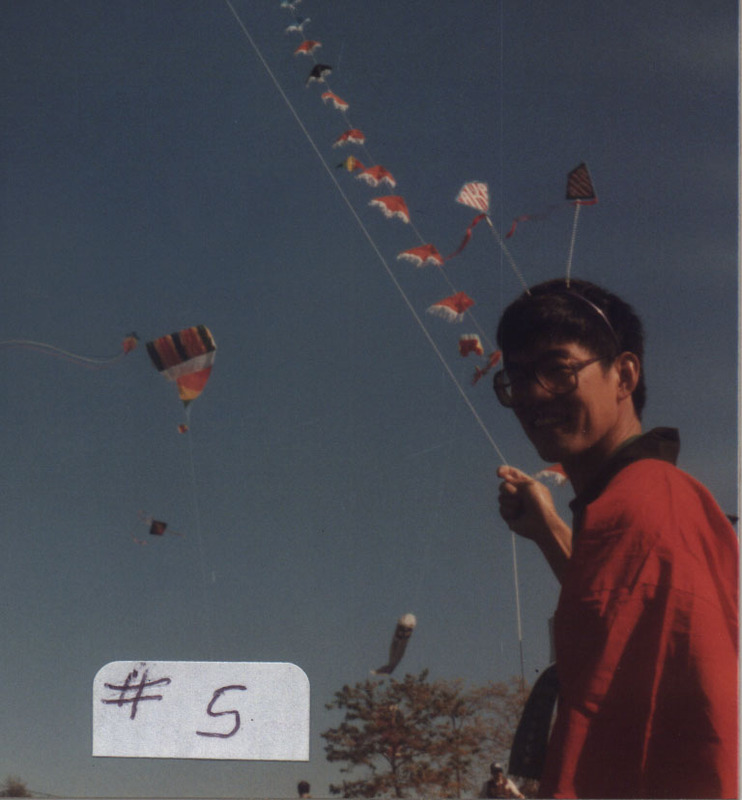 One of the most memorable kite fliers I was to meet was Takishi Nishibayashi. Affectionately nicknamed “Nishi” to all at the convention (Pic. #16) Nishi was named a Living National Treasure by the Japanese government. Nishi made a kite every day. He was always smiling and best of all he would occasionally burst out into song. Wouldn’t matter where he was, on the field or at the banquet. He would really sing out. I later learned that Nishi had taken a simple Japanese love song and substituted a kite and the wind for the lovers in the song. 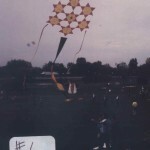 Another wonderful and legendary kite flier that has passed on to the great kite fields beyond. SO DO I REALLY WANT TO GO TO ANOTHER CONVENTION? From my perspective, I cannot understand how anyone who is a kiteflier would not want to attend an AKA Convention. It is the biggest and the best kite festival this country has to offer. True, attending a convention can and is usually expensive. Registrations can be over $100 and rooms for the five to six days of the current event can be a lot. The convention registration can now be purchased in parts to fit your schedule. You do not have to pay for the entire event if you do not plan to attend. There is frequently a kitefliers hotline for room sharing and transportation. Where there is a will there is a way. Most often the money is well spent to attend this event. 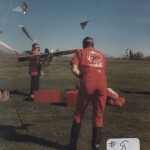 Check with your local kite club and see who else will be attending. Hitch a ride and make some friends along the way! Don’t forget to take plenty of film and notepaper. You will spend your first day or two just gawking at all the kites and making notes on the great ideas you will get from other’s creations. You will definitely get a ton of ideas for winter projects at a convention. The best thing about an American Kitefliers Association convention is the people. Wear a nametag (YOUR OWN!) and introduce yourself to as many people as possible. These are the greatest (and weirdest) people there are on the planet earth. They are kitefliers. You can finally connect the names you have read about in all the kite magazines. You will realize that they are all just people like you. Attend enough conventions and after a while you will become one of those people in the magazines that everyone comes to conventions and takes pictures of. Don’t forget to be nice to and help that “Greenie” that walks up to you on that convention field. They are kitefliers just like you! TUNE IN SAME TIME NEXT TIME FOR SOME MORE TANGENTS AND TRIVIA WHEN WE WILL ATTEND OUR FIRST EAST COAST STUNT KITE CHAMPIONSHIPS. This entry was posted in 1998, Issue 5 (Sep/Oct), KL Archive and tagged aka, convention, festival, Hawaiian, history, Tabor.